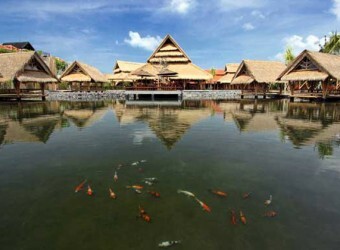 Bali Restaurant Mang Engking is a restaurant chain which you can find in the major cities of Indonesia. There is a large pond in the restaurant location, and the bamboo gazebo built on it. The restaurant offers not spicy Indonesian seafood dishes. Gazebo seating is available for a minimum of 4 people. Enjoy authentic Indonesian restaurant in a cozy place.